As promised, we have some updates and improvements to share, that didn’t make it in time for the newest printings of A Thomas Jefferson Education and Leadership Education: The Phases of Learning. Basically, it’s this: when we started teaching about the 7 Keys of Great Teaching some two decades ago, the parents and teachers in our convention talks and seminar workshops had a very different life experience and cultural context than do the young parents of today. As a result, some of the language that was so simple and obvious in the 1990s has a different sort of ring to it now, and we want to be sure that we’re covering all our bases and communicating effectively to both the seasoned and newer parents/homeschoolers/educators. 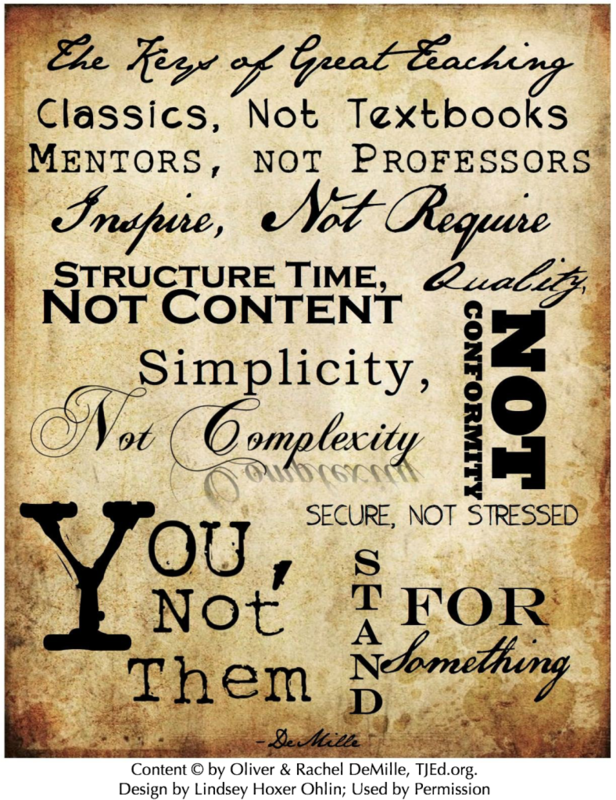 Back in the 1990s, when we spoke of “classics” or “mentors,” these were not pop-culture buzzwords, as they are today. And the contrasts we drew between classics and textbooks, or mentors and professors, really spoke to a generation that was entrenched in the idea that professors and textbooks were not just the best way, but virtually the only way, to give or get an education. Now, with alternatives proliferating, what used to be a “fringy” or “non-conformist” choice (homeschooling or charter school, or ….) is now considered a legitimate option, with plenty of validation from mainstream and respected sources. So, just to be clear, when we speak of “Mentors, not Professors,” we hope that those that find that doesn’t speak to them will make the translation. We’re not saying professors = never. And we’re not saying that the only thing that competes with great mentoring is a professor. Quite to the contrary; in the current climate, there is at least as much tendency for the prospective parent-mentor to lean rather more toward the permissive side (being a “pal” rather than a parent or a “buddy” rather than a mentor), and this can be just as devastating for a great Leadership Education as the stereotypical “overbearing, arrogant, boring, stale” professor. Same for Classics. Used to be that people totally got it when we contrasted textbooks with classics (click here for our definition of that term). Now, there is an equal-and-opposite competitor in “fluffy” works that (while they can be a part of a healthy reader’s diet) don’t provide the richness in language or content offered by the old and new works that are worthy of the “classic” designation. But then, since the new generation doesn’t have the stark experience with textbooks only (as classics are found even in public schools now), and some things that are technically “textbooks” are worthy of being termed “classic”, a strictly literal reading of the 7 Keys can be not only confusing, but downright misleading! 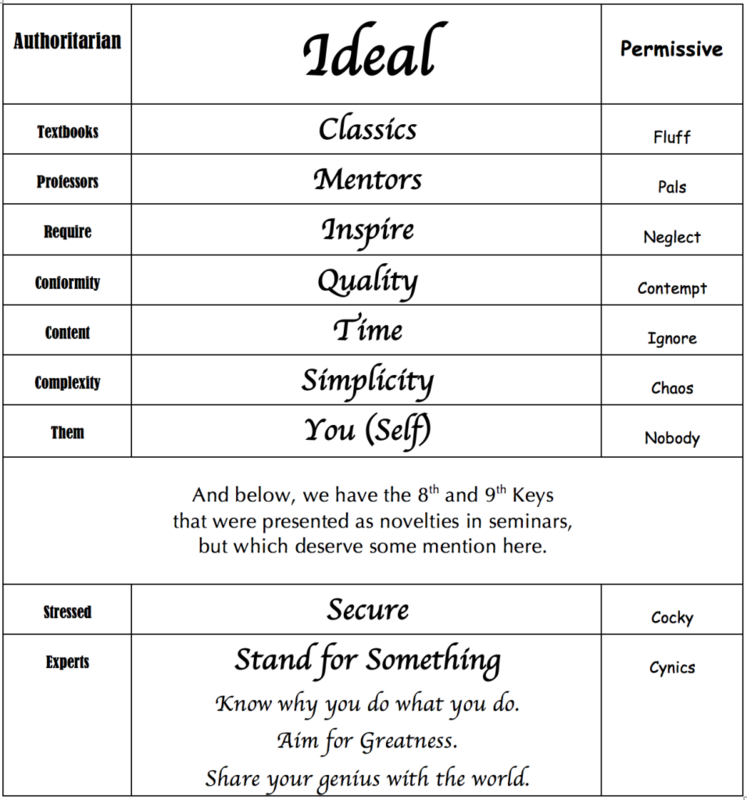 The first word of each Key (Classics, Mentors, Simplicity, etc.) is what we hope to elevate, to emphasize. And there is not just one authoritarian-centered competing value (textbooks, professors, complexity, etc. ), but an equal and opposite permissive-type value on the opposite end of the spectrum. We think that the ideal has elements of both extremes, but balances them and makes them the servant of a higher ideal. In the New 7 keys, we hope to harness some of the sentimentality of the Permissive, and some of the vision of the Authoritarian, with a clear preference for the pinnacle ideal that is named in the 7 Keys. Please refer to the audio linked above for insight on the “New 7 Keys.” And for your visual- and wordy-types….